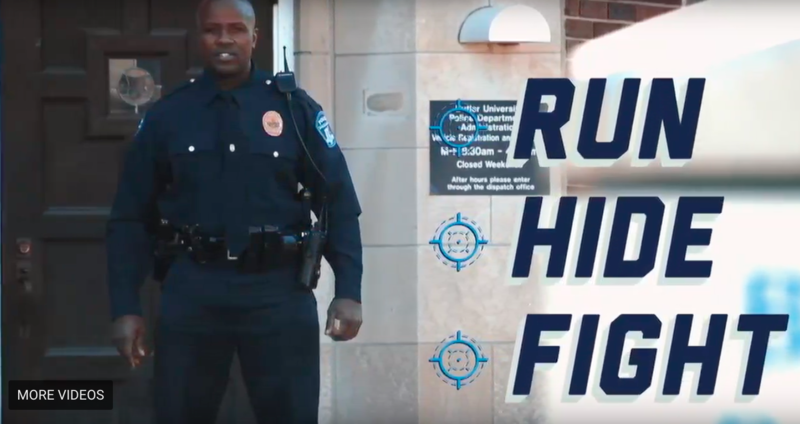 For Butler students and staff, BUPD recommends responding to an active shooter situation using the phrase: run, hide, fight. Photo from Butler’s website. On March 16, popping sounds led to erroneous reports of an active shooter and widespread fear at the University of Michigan. The situation has prompted further discussion about how universities respond to reports of an active shooter and an overall psychoanalysis of a culture in which a few loud sounds can set off chaos. The actual cause of the sounds is thought to have been popping balloons from a sorority team-building exercise. However, 911 callers believed them to be gunshots, prompting a full response from the university’s police force. Officers quickly responded to the scene and emergency alerts were sent to students. Students, faculty and visitors were then on edge for more than three hours as they waited for the all-clear from law enforcement officials. At Butler University, a response to an active shooter situation from BUPD would have many similarities. As soon as reports of the active shooter are made to BUPD, the campus-wide emergency alert system, including Dawg Alerts, would be triggered. Simultaneously, Butler police officers would be responding to the scene as quickly as possible in accordance with the semi-annual training they undergo for this exact situation. Though it may be unlikely that an active shooter situation will happen at Butler, BUPD still recommends being prepared. Tony Rivera, assistant chief of operations at BUPD, and Sergeant Roy Betz, head of emergency preparedness and training, highlighted the importance of being prepared in any situation, not just at Butler. “We know that [active shooter incidents] happen about every 25 days on average, so we have to be prepared. We don’t train here for the if — we train for the when,” Betz said. To better prepare campus, BUPD has also hosted training sessions for Butler faculty for situations like this. Robert Norris, an instructor of strategic communication, is one of the faculty members who has attended a training session. Norris now talks with every one of his classes every year about what to do in the event there is an active shooter. As a former boy scout, he advocates being prepared for any situation. Peter Bruchnak is a junior mechanical engineering major at U of M who was walking past the building where the situation occurred, just minutes before the first alerts of an active shooter were sent. However, Bruchnak did not even know what was happening until his roommate told him minutes after the reports of a shooting had already been made. Bruchnak said he found this surprising considering the fact that he thought he was signed up to receive emergency alerts on his phone, but he never got one. Bruchnak said he was alarmed by the fact he did not receive a message, but he was also glad that any failings of the systems currently in place can now be addressed in case of a real emergency. For Butler students and staff, BUPD recommends responding to an active shooter situation using the phrase: run, hide, fight. As the phrase suggests, the first and best option is to run away from the scene of the shooting if possible. Once in a safer location, it is recommended that you call 911 to help responders to better understand the situation. If it is not possible to flee, the next best option is to hide. When hiding, it is important to make sure your phone is silenced and that you are as quiet as possible. Also, doors should be locked or barricaded and lights should be turned off if possible. Lastly, if it is not possible to run away or hide, BUPD recommends that you fight. This is a last resort, but it is important to be prepared to fend off attackers if it becomes necessary. In this situation, it is important to remain calm and create a plan with others. Information about how to be prepared or receive training for an active shooter situation can be found in the public safety section of Butler’s website.